For the last few days I’ve been totally stuck on what to write about in this space. About a dozen times a day I sit down with my laptop and write a few lines that I save as a draft until I delete them an hour later. (or, in the case of this post, a minute later). My sun sign is Pisces, which is commonly depicted as two fish swimming in opposite directions. Two fish struggling to get away from the center but stuck together, unable to move. That’s me, right now. It probably isn’t a coincidence that I also feel physically stuck right now. There are a list of reasons why I feel physically dependent or confined. None of them is really a sufficient reason for not getting out (except the heat, which is ungodly in the afternoon). Every day I think of places to go, but then I usually end up choosing to stay in and read. Living as part of an Indian family has made me much more aware of my American ways. And living with a family I didn’t grow up with leaves me feeling out of sync most of the time. I find it challenging to just relax and simply “be”. I feel like everyone around me understands something that I just don’t get. In so many ways I feel I’m neither here nor there. Sam and I have been traveling between Bombay and Ahmedabad since his mom was diagnosed with cancer six weeks ago. Our travel plans and career plans are on hold until we learn more about her prognosis. Life is planned in pencil. As I write this post, I imagine some of my friends telling me to breathe and be in the “stuckness”. But I don’t like it here. I feel lonely and confused and really really awkward. I’m sure there’s some sort of lesson here that I don’t understand yet. Maybe it’s because my two pisces fish are looking in different directions. But at this moment that’s all I can see. 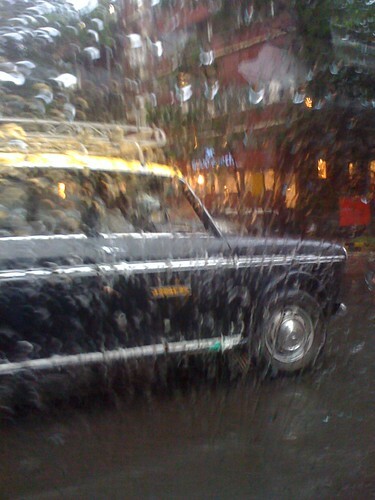 from a taxi., originally uploaded by mbdoctor19. The monsoon has started again. After nearly a week without much more than a light shower, the rains are back in earnest. I was shopping in town yesterday when the skies opened up. I waved in vain as one taxi after another floated past me. My arms were getting soaked. I was sure that my shopping bag would disintegrate at any moment. At some point I came to terms with my situation and accepted the inevitability of walking to my next destination. I retreated to the sidewalk, where I huddled under a store overhang. I rolled up my jeans, pulled on my windbreaker, and unfurled my new blue paisley umbrella. I stepped off the sidewalk and instantly felt the water rise above my ankles. I paused for a moment; something came over me as I felt myself surrender to the circumstances. I laughed silently at my earlier attempts to minimize my discomfort when I realized it was those very actions that were the true source of my agitation. It wasn’t the rain or the damp clothes that bothered me. It was my avoidance of them that was the root of my suffering. Once I embraced the truth of my experience as it was— releasing what I’d hoped it would be– I continued on my path.